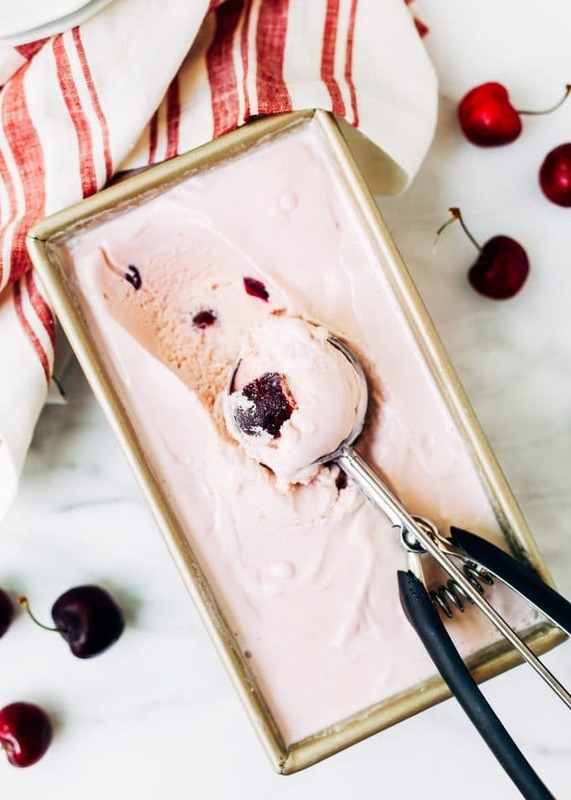 Rich and creamy with chunks of rum-soaked Bing cherries swirled throughout a custard base, this Rum Cherry Ice Cream recipe is a grownup twist on a classic. I covet the arrival of fresh cherries every year. Sweet and juicy, there’s nothing like a bowl of them, enjoyed slowly under the sun on a warm summer afternoon. 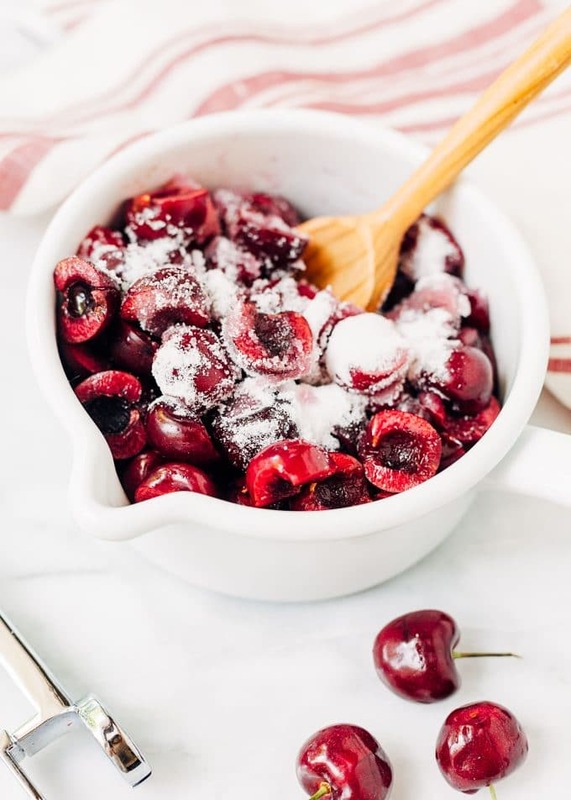 I cook with them as much as I can before the season ends: cherry clafoutis for dessert, compote for French toast and waffles, and of course: cherry ice cream. In my favorite adults-only version, I fold rum-soaked cherries into a rich and creamy vanilla custard base. 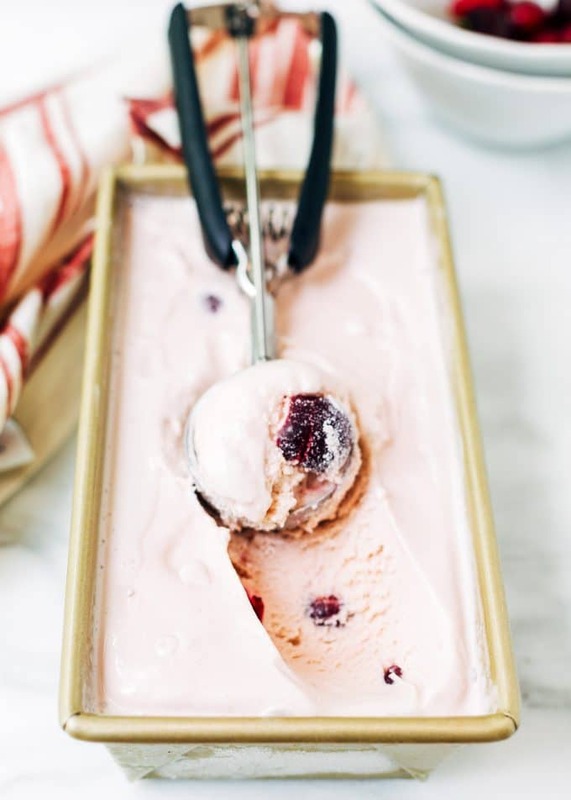 Rum Cherry Ice Cream is the perfect way to indulge in a classic summertime treat in a decidedly grownup way. The basic ice cream base recipe that I use to adapt most of my favorite flavors is Cook’s Illustrated’s Rich Vanilla Ice Cream. This recipe adds light corn syrup to a cooked and chilled egg custard base. The corn syrup helps keep the ice cream easy to scoop after freezing and cuts down on the icy mouthfeel that many homemade recipes have. I adjusted the milk/cream/corn syrup proportions of this base to accommodate the fruit, juices, and liquor in my rum cherry ice cream recipe. The corn syrup you buy in the baking aisle of the grocery store differs significantly from high fructose corn syrup. While both sweeteners are made from corn starch, high fructose corn syrup converts some of the glucose to fructose. Many corn syrup brands (including Karo, which is a staple in my pantry) are entirely glucose and do not contain any fructose. Want to read more about the food science behind corn syrup? Check out “Corn Syrup vs. High Fructose Corn Syrup“ from Fine Cooking. That said, all varieties of corn syrup are processed sweeteners. I do try to limit processed foods as much as possible in my diet, but allow some room for occasional indulgences such as a bowl of this ice cream. If you avoid processed sweeteners entirely, this would not be a suitable ice cream recipe for your diet. If you’ve ever tried to add raw fruit to your ice cream base, you might’ve noticed that the chunks of whatever you added, whether it’s strawberries, cherries, or melon, become solid, icy, and difficult to eat after freezing. They’re a stark contrast from a velvety ice cream base! The trick to avoiding this is to cook or macerate your fruit to soften it and draw out the juices before adding them to the ice cream. With less liquid, the fruit will still freeze, but not impossibly so. For this recipe, I like to simmer the Bing cherries with sugar to create a cherry syrup from the juices. After straining, I churn the syrup into the ice cream base for natural color and flavor. I then soak the cooked cherry solids in rum and fold them into the ice cream just before transferring it from the ice cream maker to the freezer. Since the cherries are both cooked down and soaked in alcohol, they don’t freeze to an ice cube-like consistency. If rum isn’t your favorite liquor, others can certainly be substituted. Brandy or bourbon would be classic pairings, kirsch would up the cherry ante, and chambord would bring an underlying berry note. Boozy ice cream is a bit more susceptible to melting, so it’s best to enjoy right away after scooping. But, let’s be real, with a bowl of Rum Cherry Ice Cream in front of you, are you really going to wait that long to dig in? I’m not! 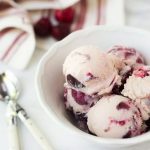 Rum soaked cherries make this ice cream an extra-special treat for adults, but it is equally delicious with the alcohol omitted. Serve on its own or with a drizzling of hot fudge! Makes a little over one quart of ice cream. Combine cherries and 1/3 cup granulated sugar in a medium saucepan. Simmer over medium heat, stirring, until cherries have begun to soften and juices are a syrup-like consistency, about 8-10 minutes. Strain syrup into a bowl and set aside. Place cherries in a separate bowl and stir in rum. Cool both syrup and rum-soaked cherries to room temperature, then refrigerate, covered, until well-chilled. Stir together whole milk, heavy cream, light corn syrup, and kosher salt in a heavy-bottomed saucepan. Cook over medium-low heat, stirring, until mixture is steadily steaming and reads about 175 degrees. Remove from heat. Whisk together egg yolks and remaining 2 tablespoons of granulated sugar in a medium bowl. Gradually whisk about one third of the warm milk into the yolks. Return yolk mixture to the pot, stirring to combine. Cook over medium-low heat, stirring, until the custard is thick enough to coat the back of a spoon. Do not boil. Strain custard through a fine mesh sieve into a large bowl and stir in vanilla extract. Let stand at room temperature for about 10 minutes. Cover with plastic wrap and refrigerate until well-chilled, at least 4 hours, preferably overnight. When ready to churn, stir reserved cherry syrup into the custard. 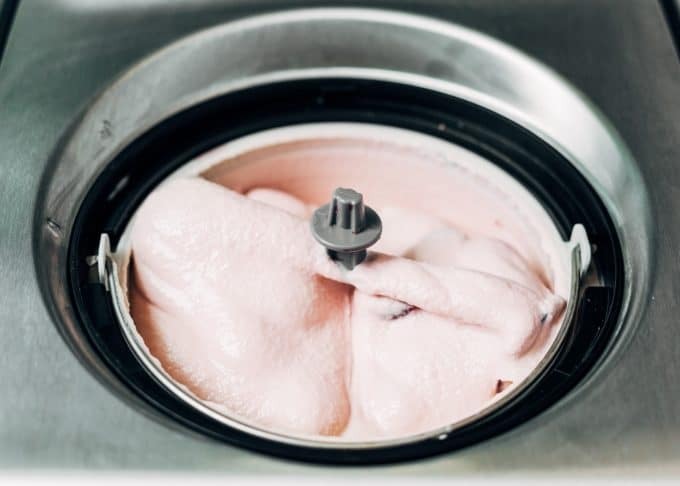 Freeze according to your ice cream maker's directions until a soft-serve consistency is reached, adding reserved cherries (and any accumulated juices/rum) during the last 4 minutes of churning. Transfer to a freezer safe container, cover with plastic wrap, and freeze until ice cream is firm and scoopable, at least 4 hours. Originally published July 6, 2016. My ice cream maker is collecting dust right now, I always struggled a little to make home made ice cream in a nice texture. This post has given me sooo much useful insight, and this flavor combo sounds crazy delicious. Thanks so much for sharing! I am like you and totally covet cherry season! It always ends too quickly, and ended even sooner than usual in CA this year given the incredibly hot weather – I was so sad. We bought in bulk from the farmers market and froze a heap to keep the season going for longer. This ice cream sounds absolutely amazing!! Why oh WHYYYYY did I give away my ice cream maker!?! I’m just imagining this with bourbon, and drooling. Maybe I can make a milkshake version haha- It’ll have to do for now!!! I’m with you, Amanda – sweet, ripe summer cherries are the BEST! As a self-proclaimed ice-cream snob, I officially ordain you as a member of our tribe. I agree with your assessment of Philadelphia-Style vs. egg custard and I am green with envy over your new addition! So sleek, so cool — very chefy! 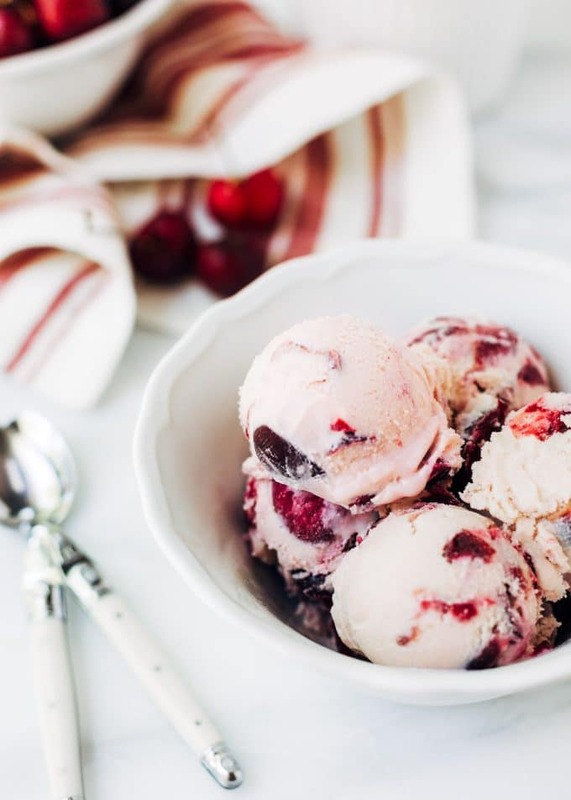 As far as the ice cream is concerned – I mean, hello… Rum and Cherries? It’s like you’re whispering sweet nothings in my ear… ahem! I love cherries. adding rum put this over the top. Great picture and it is hard to get a good pic of ice cream. This looks just incredible! I adore ice cream and wish I had a big bowl of this in front of me right now! Thank you Amanda…..it’s a perfect recipe to cook with kids and enjoy with all family. Your photos are always so on point!